What sound effects can your gear capture? Last week’s post presented a chart of decibel levels for common sound effects. The article explored how equipment selections affect capturing sound subjects at different loudnesses. The chart is revealing for other reasons, too. Of course, it shows the level of sound created by things around us. It’s common sense that a power saw is louder than library crowd chatter. However, the chart becomes more interesting the narrower we look at these numbers. For example, a chainsaw is 10 dB louder than a power saw. Thunder is louder than a power saw, and about as loud as the chainsaw. Why does this matter? Well, of course the list gives us a guide of how loud things are so we can judge if field recording equipment can capture sounds cleanly. It also invites us to think about sound more generally, too. 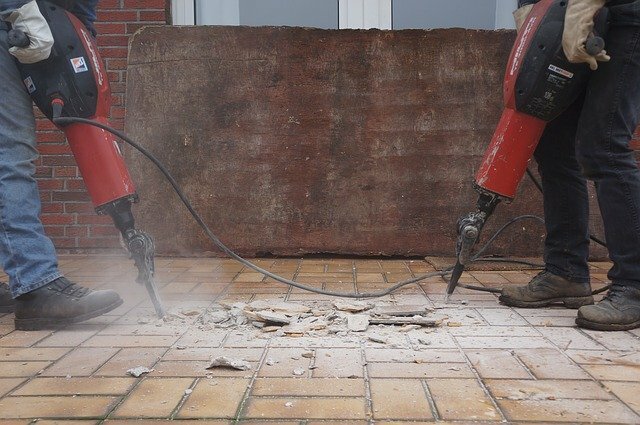 The chainsaw is louder than the power saw by 10 dB. That is what the numbers show us. But what is it like to experience that difference? What does a 10 dB difference feel like? So, today’s post will explore the chart with a different slant: how do sound effect levels affect hearing? To review, let’s look at the list again. I’ve added a new column: damage. We will look at that a bit later. Humans can hear from 20 Hz to 20,000 Hz. In a lab under ideal conditions, we can hear 12 Hz to 28,000 Hz. Humans best hear the frequencies from 2,000 Hz to 5,000 Hz. This means we can pick out details more easily and sense differences more simply from sounds in this range. For instance, at this range, the ear can sense pure tones at -9 dB. Learn more about our hearing range and the threshold of hearing. The loudness doubles thereafter for each 10 dB increase. So, a 30 dB increase is 8 times as loud, and a 40 dB increase is 16 times as loud. And how does distance affect loudness? Sound level drops by 6 dB when distance is doubled. Many of these measurements depend on hearing a constant tone of specific frequencies at certain pressure levels and temperatures for a sustained time, but you get the idea. Our sense of hearing diminishes naturally over time. The amount varies, with some upper-frequencies disappearing as early as 8 years old, and the majority generally changing at age 25 for men and 30 for women. Men lose 5 to 10 dB by age 40, which is interesting since we saw above that a 10 dB change is diminishing loudness by half. Those are natural changes. What about hearing loss due to noise? As field recordists, the chart is revealing for another reason: we can learn what sounds will cause damage, and how quickly. Generally, sound is painful at around 120 dB, with 133 dB commonly seen as the threshold of pain. Two organizations have created guidelines for exposure to noise. They provide a good overview to learn how much sound is safe at a certain levels. The Occupational Safety and Health Administration (OSHA) have created a chart of Permissible Noise Exposure. 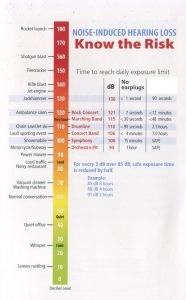 It shows how long it is safe to be exposed to various decibel levels. So, using our chart as a guide, we can see it’s possible to be exposed to an electric drill for 5 hours, but only 1 for a snow blower. The OSHA recommends only 15 minutes of exposure to a football game. The National Institute for Occupational Safety and Health (NIOSH) created a more detailed chart of Daily Permissible Noise Level Exposure (here’s a PDF with more extensive info). Their levels are a bit different than the OSHA chart. It’s designed to provide guidelines for workplace noise. Just the same, it’s interesting to think of the recommendations in terms sound fx and what their loudness means. For example, at 85 dB, you can listen to a food processor for 8 hours and be okay. Fifteen minutes of a 100 dB motorcycle is tolerable. They recommend only one-and-a-half minutes exposure to a power saw, though, and less than a second of exposure to a stock car race. What can you do to protect yourself from loud, damaging sounds? Use hearing protection, of course. Last week’s post showed a flyer included with some hi-fi ear buds I purchased. What’s also interesting about the chart is a column beside the louder sounds: the time to reach your daily exposure limit of noise. One column shows the time without earplugs. The next shows the time using professional earplugs. I blanked out the manufacturer’s name so this post wouldn’t seem like an advertisement for their headphones. However, it gives us an idea of how loud sounds are affected by hearing protection. According to Wikipedia, earplugs sold in the USA have a EPA noise reduction rating (NRR) (example 1, example 2) that diminishes loudness by a fixed amount. Earmuffs in some cases work a little better and can reduce noise by 17 – 33 dB. The reduction depends on frequency, though; it’s not a straight reduction across all frequencies. Some popular earplugs on Amazon have a NRR of 32 dB. Their most popular earmuffs have a NRR of 22 dB. What’s the real-world effect of this? Well, the earplugs would make thunder as quiet as a snowmobile, a subway seem like a shower, and a telephone ringing as soft as a refrigerator. Those seem like impressive differences. The earmuffs aren’t as good, though, so the thunder would still seem as loud as a power saw, the subway would seem like a whistling kettle, and the telephone ringing like a dishwasher working. Noise reduction is important to protect our ears, of course. It’s also interesting because the reduction amount illustrates the power of sound between seemingly related subjects. The power saw is 110 dB. The chainsaw is 120 dB. Take a moment to think about those sounds and your recollection of them. Judging from memory, they don’t seem too differently loud. However, their 10 dB difference is actually pretty significant. Even 10 dB actually seems twice as loud to the ear. Highly-rated earmuffs reduce the amount by 4 times, but the chainsaw will still seem as loud as a jackhammer (110 dB). This works on the other end of the scale, too. Normal conversation (60 dB) will appear to be twice as loud as moderate rainfall (50 dB). Television (60 dB) is seems 8 times as loud as a soft whisper (30 dB). 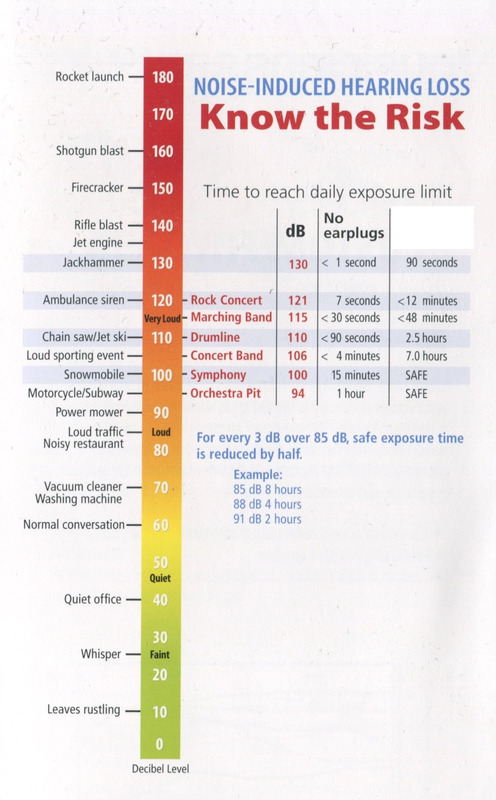 Well, the decibel level chart encourages field recordists to think about the different strengths of sound effects. It guides us to choose equipment to capture field recordings properly. That helps when preparing for a shoot. It comes into play during a session, too. How? It invites sound effect fans to think about the difference between subjects: that even 10 decibels between seemingly related sounds is actually a significant difference in power. This helps when recording focused specific sound effects, when navigating from one sound to another. It’s also helpful when field recording generally. While the chart depicts individual sounds, atmospheric field recording often includes many of these together. So, the levels are helpful to consider when comparing different sounds. Will one subject overwhelm another? Compliment it at a similar decibel range? Will two subjects compete? This helps when recording sound effect ambiences that combine many different sounds. Thinking about these strength of all the individual “voices” that comprise a sonic portrait helps field recordists develop a vital skill: it moves us away from a passive craft of receiving sound to engage us more actively in the sounds around us.